...a utopian society having absence of government and made up of individuals who enjoy complete freedom. Total Anarchy is a competitive flyball club from beautiful Victoria, BC Canada with a small mainland chapter. We have many proven training methods and are always looking to improve both handlers and their dogs. We strive to ensure a safe, positive and fun environment at all times. In our first full year of racing, we won the 2002 Region 7 Championship. Since then, we've recruited new dogs and had others move on, so we took our time to rebuild our strength of core dogs. Our hard work paid off - in November 2008, our two teams placed First and Fourth in the World Cynosport Flyball Championships! 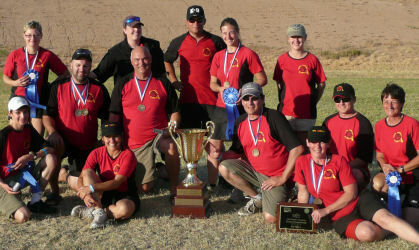 In August 2009, we took First place in the U-Fli Canadian Rockies Championship Qualifier! To provide an environment that members and their dogs enjoy. To be as competitive as possible while still meeting goal number one. 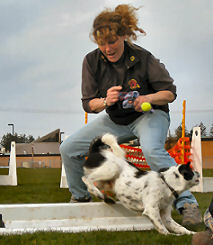 To regularly enhance our training methods so that we can continually improve our dogs in order to meet goal number two. We are always looking to recruit dedicated handlers and dogs that will fit into the spirit of our club. We are competitive, racing approximately ten weekends per year, throughout British Columbia, Washington and Oregon. Travel and committment are required. Whether you've been playing flyball for years, or have just heard about the sport for the first time, we encourage you to contact us. We accept dogs of any age, breed, ability or speed. New dogs and handlers are trained in small, informal lessons. Pups as young as two months old may start in our comprehensive "puppy-safe" training program. We will arrange your attendance at one of our training sessions where we can evaluate each other for potential membership. We choose our members based on quality, not quantity! If you are interested in joining or have any questions please feel free to contact Joanne at: taflyball@gmail.com or (250)478-6731.